To improve the quality of life in Eastern Indiana by building better places to live, work, and play through collaboration, planning, and cooperation utilizing public and private funding. Upon successful implementation of the SET plan, the five counties that comprise the Eastern Indiana Regional Planning Commission will once again have created a vibrant, growing region with increasing population, advancing educational attainment, rising per capita income, an expanding and diversifying economy, improving physical and mental health, and a “quality of place” that meets or exceeds the expectations of our current and future citizens and employers. Thursday, May 25, 2017 from 6:00 to 8:00 P.M.
What: A Public Forum designed to introduce the Eastern Indiana Regional Planning Commission new Regional Economic Development Plan to the citizens of the 5-county Region. Purdue will share the underlying economic data that led to the selection of the Goals used in the plan. Members of the regional planning committee will share details of the six goals selected for inclusion in the plan and the underlying objectives and strategies to be employed when implementing the plan. Finally, representatives of funding agencies will share information on their programs that may be applicable to elements of the plan. The Eastern Indiana Regional Planning Commission will introduce the public to its newly approved Regional Economic Development Plan which has been designated as a High Quality Plan by the USDA’s Office of Rural Development. The staff of the Purdue Center for Regional Development will share the economic and demographic data that led to the plan’s goals. Members of the Planning Committee will share the six Goals established in the SET Plan. Members of Rural Development, OCRA, and other funding agencies will discuss how their support might assist in implementing elements of the plan. Please join us in reviewing the results of the past 18 months of planning for our Region’s development. To insure attendance by the widest audience possible from throughout the Fayette, Randolph, Rush, Union and Wayne County Region, please feel free to share this invitation with your contacts who may be interested. The Eastern Indiana Regional Planning Commission has been organized under the authority of Governor Mike Pence as outlined in Indiana Code IC 36-7-7. Fayette, Randolph, Rush, Union, and Wayne Counties have banded together to engage in collaborative economic development planning. Building on their many successes of the past, these five counties have committed to a future of working together for the betterment of the entire region. 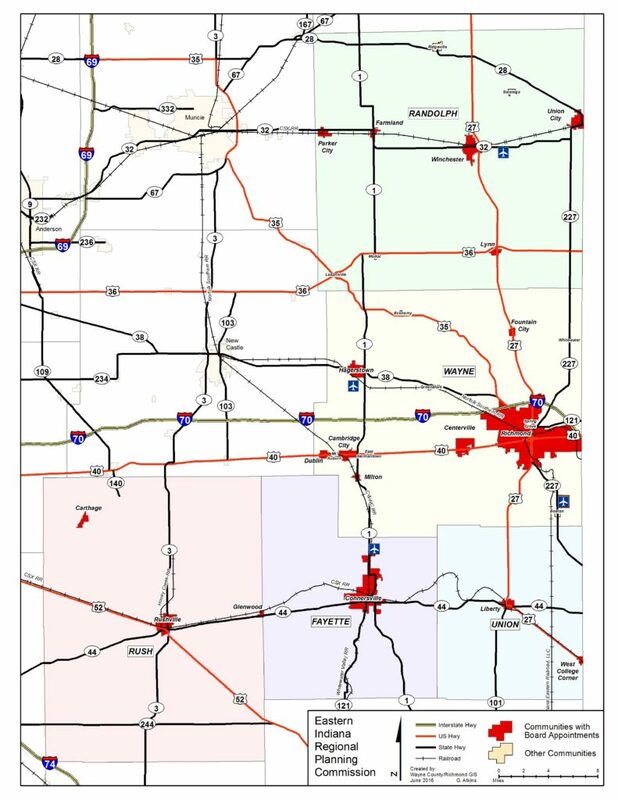 Designated an Economic Development District by the U.S. Department of Commerce Economic Development Administration in 1993, EIRPC will serve five counties in Eastern Indiana. These counties are united in the knowledge that they share many of the same attributes and aspirations and have a firm belief that they are stronger together than they are separately. A Board of Directors governs the organization with representation from each of the member counties as prescribed by statute. County commissioners, County Councilmembers, municipal leaders, economic development professionals, economic development board members and representatives of business and industry speak on behalf of their respective counties and the region to guide the organization. Elected officials, again by statute, comprise at least two thirds of board membership. The full board meets quarterly. The executive committee meets monthly and is comprised of the officers and a board member representing any county not represented by an officer. Eastern Indiana RPC staff will work with communities and municipalities on planning, project development, grant writing, technical assistance and information for local governments and will facilitate meetings to foster greater collaboration. EIRPC staff will not be directly involved in economic development marketing efforts but will rather provide aid and support to local governmental agencies whenever feasible. EIRPC will work closely with State agencies including Indiana Department of Transportation, Indiana Department of Agriculture, Indiana Office of Community and Rural Affairs, Indiana Economic Development Corporation, Indiana Department of Natural Resources, Indiana Department of Environmental Management and Institutions of Higher Education. Coordination with these agencies will allow the rural counties of Eastern Indiana to have a voice in activities and policies developed at the State level that impact rural areas. As part of this plan, EIRPC will develop specific program areas that provide direct assistance to the counties and coordination with state agencies. We, the representatives of local governments of five Eastern Indiana counties, named Fayette, Randolph, Rush, Union, and Wayne, hereby join together in a voluntary organization called the Eastern Indiana Regional Planning Commission (EIRPC). This Region is a part of an Indiana statewide organization of Regions created for the purpose of providing the local leadership, cooperation and coordination required for carrying out the wishes of our local governments in a manner of a regional planning agency, relative to the receipt of federal, state and private funds that are appropriated for various projects and programs in our area. We realize that our individual and common destinies rest with the interdependent actions of the local governments which comprise our Region. This voluntary Region which we have formed shall be a vehicle for closer cooperation of local governments and shall recognize the sovereign status of all member units and shall not intervene in matters of local jurisdiction. Our only power shall be that created by the cooperation of all member units to influence the legislature, federal, state and private funding agencies toward the needs and the solution of our mutual problems for the mutual benefits of our member units. Our goal is to retain and strengthen local home rule while combining our total resources for regional challenges best met through the cooperative efforts of local governments. To serve as a mutual forum to identify, discuss, study and bring into focus regional challenges and opportunities. effective communication and coordination among governments and agencies. To create, develop and review policies, plans and priorities for regional growth and development. groups or organizations and, when requested, to serve as spokesman for local governments on regional projects and issues. regionally approved agreements, policies, and plans. To review, coordinate, and in some cases implement federal, state, and local programs of regional importance. To encourage contributions of research assistance, technical expertise, and financial resources from private research organizations, civic foundations, institutions of higher learning and other organizations. Sec. 2 The powers of this organization are restricted to its purpose as stated in Section I of this Article and shall recognize the sovereign status of all member governmental units and shall not intervene in matters of local jurisdiction of any member units, unless it be by request of the member units and then only to the extent of mutual cooperation and coordination for the total benefit of the region. Sec. 3 Actions of this organization shall be guided by these By-Laws and the member units and by the various acts of legislation by the federal and state governments pertaining to the operation of a regional planning district. This agreement shall be in effect for an initial term of three (3) years from its effective date shown in the minutes of organization and shall continue thereafter from year to year without the necessity of a formal renewal by any party hereto, unless terminated as hereinafter provided. After the initial three-year term, any party hereto or member of the District may withdraw its membership by resolution duly adopted by its governing body and upon giving twelve (12) months written notice of withdrawal to the other parties or members hereto without the effect of terminating this agreement. Contractual obligations of the withdrawing member shall continue until the effective date of withdrawal. In event there is a complete termination of this agreement which would involve the disposition of its properties, the property shall be liquidated, and each principle member shall be entitled to a proportionate share of the proceeds. in event of the withdrawal by a member, the non-federal matching contribution to any approved federal grant by all members shall be firm. The projects shall be completed and the required reports and accounting shall be completed. Fayette, Randolph, Rush, Union, and Wayne Counties. In addition to the County members listed above, membership shall be given to all incorporated cities and towns within the member counties in the District’s area of service. Membership shall be authorized by ordinance. Sec. 2 Membership on the Region’s board of directors shall be on the ratio of two (2) elected officials for each citizen member. Each county shall be entitled to designate members who will serve as voting representatives selected in the following manner: (1) One representative from the Board of County Commissioners; (2) One representative from the County Council; (3) one representative from each of the 5 (five) largest municipalities in each county appointed by the executive of the municipality. (4) For any county with a population over 50,000, one representative from the 6th and 7th largest municipalities appointed by the executive of the municipality. (5) In the event that municipalities do not exist in the number required, the County Executive Body will appoint At-Large members to the board to fill all vacant positions for a county. (6) Counties with over 50,000 population will be represented by the County Surveyor or his/her designee. (7) The Governor of the State of Indiana shall appoint a non-voting member. The term of office of each elected representative shall be coextensive with the term of office to which they are elected, unless at its first regular meeting each year the appointing authority shall appoint another official as its representative. The term of each non-elected representative shall be for a period of three years. Assessment of each member unit for the Region’s Budget of Operations will be made on a per capita basis. Population figures utilized shall be those of the last preceding federal decennial census. The assessment for the initial three-year agreement will be 20 cents per person for 2016, 30 cents per person for 2017, and 40 cents per person for 2018 and beyond unless or until a new dues structure is agreed to by the Board. Assessments from each county can be paid either annually or quarterly and will be due no later than by the 15th day of the first month of each quarter beginning in January of 2016. The member governments of the region shall act as the general policy body. Voting members shall be as set forth in Article 3, Section 2. Voting shall be by voice vote unless a roll call is requested by any member in attendance. A representative of the Governor of the State of Indiana shall serve ex-officio as a non-voting member of the District. A quorum of the Region shall consist of a simple majority of voting members. A quorum of the Executive Board shall consist of a simple majority of voting members. Sec. 1 The Region shall meet quarterly. Special meetings of the Region may be called by the chairman or by request of two (2) or more of the member governments of the district. Sec. 2 All meetings at which official action is taken shall be open to the general public. Action of the region shall be official if taken at a regular or properly called special meeting and approved by a majority vote if a quorum is present or by written concurrence of a majority if a quorum is not present. Sec. 4 Electronic participation for both Regular and Special meetings of the Board and of the Executive Committee is allowable for any member who has submitted prior written notification to the Executive Director. The region shall elect from its membership a chairman, one (1) or more vice-chairman, a secretary and a treasurer, who shall perform the duties usually pertaining to their respective offices, together with such other duties as may be from time to time assigned to them. The treasurer shall give bond with approved surety for the fruitful performance of his duties in such amounts as shall be required by law and shall comply with all rules and regulations of the State Board of Accounts of Indiana and of the federal agencies involved. The district may incur such expenses incidental to such office. Officers of the region shall be elected at the first regular meeting of the calendar year for a term of one (1) year or until their respective successors are elected and qualified. All officers may be re-elected for successive terms. Sec. 7 Nomination of officers shall be made from the floor and the elections shall follow immediately thereafter. Sec. 8 A candidate receiving a majority of the vote shall be declared elected. Sec. 9 Vacancies. Any vacancy in the officers of the district shall be filled immediately by election from the membership by regular election procedures. Sec. 1 The region shall establish committees it deems necessary to assist in carrying out the purposes and functions of the district. Sec. 2 The region shall authorize and define the scope of responsibilities of all committees it so appoints. (c) Transaction of business of the region between regular meetings of the membership. Any action of the executive committee may be appealed to the full membership of the district for review and final action by any one (1) member of the district, whether or not he be a member of the executive committee. Sec. 1 The region shall establish an agenda to be followed at all meetings. Notice of all meetings together with the agenda shall be furnished to all members not less than seven (7) days prior to any such meeting. The region may also adopt any further rules and procedures it deems necessary. The region shall hire an executive director and from time to time establish other staff positions to carry out the administration and technical functions of the organization, all to serve at the pleasure of the region. The executive director shall be responsible for coordinating all staff and consultant services provided to the region, preparing and administering the annual work program and budget, employing, retaining and removing all personnel as may be necessary and performing all other duties delegated to him/her by the region. The executive director shall have the authority to hire such personnel and obtain such supplies as are necessary and as are authorized and provided by the administrative budget. The disbursement of all funds shall be upon such written warrant voucher, requisition or claim as may be required by law and properly executed by any two (2) of the following officers: Chairman, vice-chairman, secretary or treasurer. The executive director shall endorse his/her written approval upon every requisition or claim before presenting action for payment. On or before the 1st of July of each year the region shall prepare and submit to the member units for approval a proposed annual administrative budget for the ensuing year. The budget for the ensuing year shall be the final adjusted budget as formally approved by the members. Adopt and amend by-laws and elect annually a chairman, one (1) or more vice-chairmen, secretary and treasurer. Keep complete financial records pertaining to the programs and activities of the region and its members, receipts from activities, and any and all other moneys from every other source whatsoever, together with a complete record of all expenditures or disbursements made for or on behalf of the activities and programs. The region shall in all aspects comply with the general laws regulating the conduct of public agencies and applicable to the State of Indiana and the federal government. Reports of the activities of the region and also the financial reports shall be made annually and distributed to the member governments. An audit or compilation of the district’s finances shall be conducted by the State Board of Accounts or by an independent accounting firm hired by the district for said purpose on a schedule approved by the Board of Directors. These by-laws may be altered, amended, or repealed by the authority of the Executive Board of the district. Sec. 1 The principal office of the District shall be located at , Indiana.